We're not at the Macworld Expo this year, but we're tracking feeds from several different websites. Kudos to AppleMatters for a text-only feed that's updated constantly! We miss the days when Apple would webcast the keynote live. PC: "2008 is the year of the PC." Mac: "What have you got planned?" PC: "I'm just going to copy everything you did in 2007." Steve Jobs announces that 2007 "was an extraordinary year for Apple", thanks its customers. Apple has shipped 4 million iPhones and sold 5 million copies of Leopard. They estimate that 20% of Mac users are now using Leopard. Microsoft Office 2008 is shipping today, the last "essential" Mac app to go Universal and fully support Intel Macs. The first new product is Time Capsule, a WiFi router and network server. It has an AirPort Extreme base station and a hard drive, letting you backup wirelessly - over the air. Available in February at US$299 with 500 GB of storage, $499 with 1 TB. This fulfills one of the promises of Leopard that Apple didn't deliver on with the first release. Apple is #2 in the smartphone market at 19.5%, well behind RIM (the Blackberry people) at 39% and well ahead of the competition - the next three vendors have 20% market share between them. The iPhone is twice as popular as the Palm smartphones, which are ahead of Motorola. Apple and Google have really enhanced Maps on the iPhone, which can now show your current location. It can use this for driving directions - clever! The "pseudo-GPS" feature comes from Skyhook Wireless. You can now rearrange icons/buttons on the iPhone - and add new ones. You can now have 9 different home screens on the iPhone. All of this is available to iPhone users with the newest iPhone firmware update. Apple has added five apps - Mail, Maps, Stocks, Notes, and Weather - to the iPod touch. The latest revision of the iPod touch will also know your location. This will be available as a $20 update for existing units. Apple has sold over 4 billion tracks through the iTunes Store, as well as 125 million TV episodes and 7 million movies. Jobs announced iTunes Movie Rentals: Touchstone, Miramax, Newline, Lions Gate, 20th Century Fox, Disney, Paramount, Sony, and Universal are all in on the program, which launches today in the US with 1,000 movies. You'll be able to movies on your iPod, computer, or Apple TV. You'll have 30 days to begin watching a rented movie, then 24 hours to finish it. $3.99 for new movies, $2.99 for older ones. Movies will be added to iTunes Movie Rentals 30 days after DVD release. Jobs admits that Apple missed the target with Apple TV. Unlike the original, Apple TV 2 does not require a computer. At. All. You can rent your movies using Apple TV 2 and have full HD support and Dolby 5.1 audio. HD movie rentals will cost $1 more than regular movie rentals. Apple TV 2 has a brand new interface. The big question is whether the movies are 720p or 1080i. ATV2 can recommend movies based on what you've rented. iTunes Movie Rentals includes previews, just like the iTunes Store has always done with music. You can buy TV shows at $1.99 per episode, and ATV2 will sync them back to iTunes on your computer. It can do the same thing with music. ATV2 can access .mac web galleries for both audio content and iMovie files. The best news of all: ATV2 is a free software upgrade for the original Apple TV, and Apple has cut the price from US$299 to US$229. The new model ships in two weeks. "Well, as you know, Apple makes the best notebooks on the planet...."
The new notebook is the world's thinnest, according to Jobs, and it's called the MacBook Air. Other ultralight notebooks weigh about 3 lb., have an 11" or 12" display, use a shrunken keyboard, and have relatively slow CPUs. Too many compromises, says Steve. Not so the MacBook Air. It's 0.76" at its thickest, 0.16" at its thinnest. Amazingly, this thing has a 13.3" LED backlit display, a full-sized keyboard, and the traditional Apple built-in iSight webcam. Jobs says it's Apple's best notebook ever, and it supports iPhone-like gestures on its large trackpad. How did Apple make it so thin? It uses a 1.8" hard drive, the same 80 GB drive found in the iPod classic - or a 64 GB solid state drive. TMO notes that the motherboard itself is tiny. 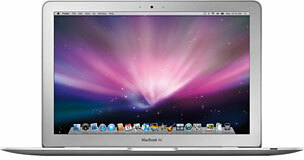 With a 1.6 GHz Core 2 Duo CPU (1.8 GHz optional), it's just a bit slower than the 13.3" MacBook. The CPU is 60% smaller than usual. There is no built-in optical drive, although you can add an external USB 2.0 SuperDrive for US$99. You can install software wirelessly with a new feature called Remote Disk. Ports include USB, Micro-DVI, and a headphone jack. There is no built-in ethernet port, although Apple will sell you a USB 2.0 ethernet adapter for $29. The MacBook Air run up to 5 hours with AirPort enabled and weighs just 3 lb. It includes 2 GB of RAM and retails for US$1,799. It begins shipping in two weeks. Oh, and did we mention aluminum, just like the MacBook Pro?